What-cha-gonna-do when 80s pop culture runs wild on you! By pure luck, I was on YouTube yesterday running a search and came across a trailer for the new 80s Mania Wrestling game. I was intrigued enough by the characters alone to download the app immediately and give it a try. Before I give my thoughts though, watch the trailer and see if it has the same impact on you! I've played card collecting games in the past like Transformers Legends and G.I. Joe Battleground. In fact, G.I. Joe Battleground was my favorite game for about a year and was very disappointed when it was discontinued. Thanks to 80s Mania Wrestling, my interest in card collecting games has been rejuvenated! 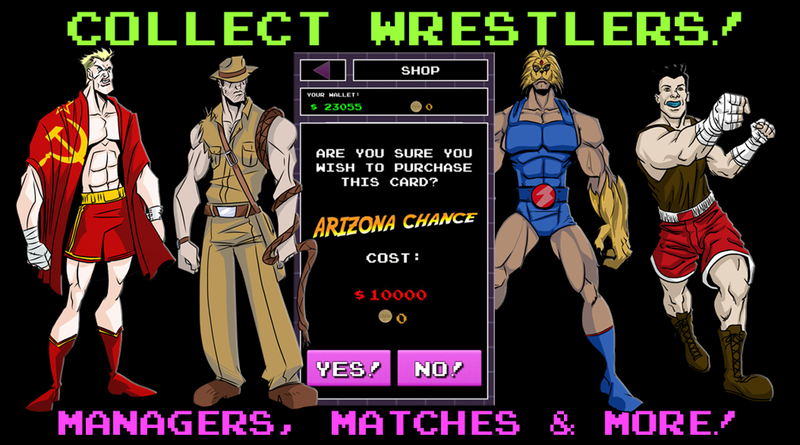 80s Mania Wrestling mixes the scene of early pro wrestling business with vibrant characters based on '80s pop culture. This strategy game gives you control of wrestlers, managers, venues, sponsors, and more to develop your own events and company. Your journey to entertainment greatness starts in January 1980 and ends December 1989. Each month features 4 events controlled by you and also tips to earn more revenue. By earning cash or buying tokens, you can buy new cards in the shop each day. Unlock special tag team and rival cards by featuring certain wrestlers in matches. And about those wrestlers...how totally rad are these guys??!!! You'll find over 100 original characters that parody actual wrestlers and popular movie/TV characters from the '80s. Each card features different attributes that can be developed through participating in events. I'm only a day into playing and I'm having a great time. You can play at your own pace which is nice, but certain events require more wrestlers so there can be roadblocks to binge playing. Other collecting games also have nicer animation and such when it comes to the action, but 80s Mania Wrestling is still early in development. I appreciate that this is more of a startup game and that the developers seem to interact well to player suggestions and comments on social media. Whether you are wrestling fan now or haven't been since the days of the WWF and WCW, I'd recommend 80s Mania Wrestling! Download it now from Google Play or iTunes. 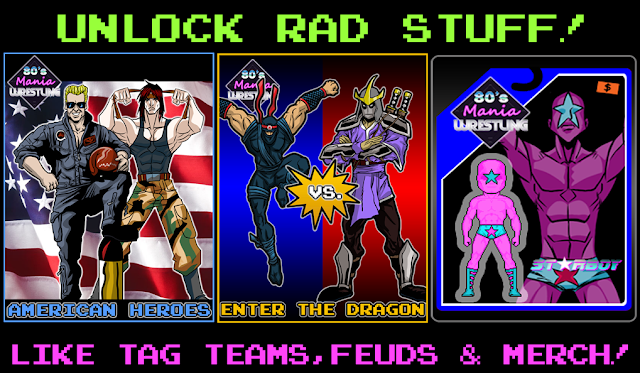 Also visit 80sManiaWrestling.com for more information and also follow the game on Facebook and Twitter. Let me know what you think of the game in the comments below. See you in the ring!